Expedia Cabana de Bergantinos vacation packages will help you save money! Combining your reservations will give you more cash to splurge for your amazing vacation. Reserve your travel package on Expedia and save as much as C$590*. There's no need for you to search through a bunch of websites for your travel bookings. With more than 400 partner airlines and 321,000 properties around the world, our extensive database has all that you need. If you have to change your vacation plans, we will honor your cancellation request on almost all bookings with no added fees. There are stacks of exciting things you can do when you're in a new destination. So why not get your trip to Cabana de Bergantinos off to a great start by taking a look at some of our suggestions? After all – out there starts here! 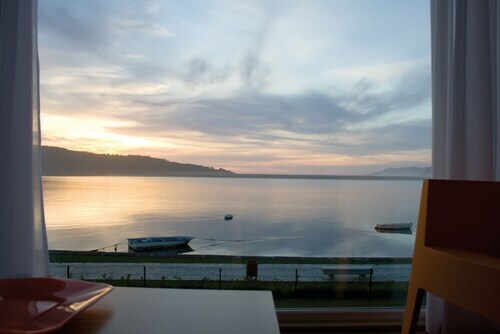 Pick up some potato chips and a bottle of vino and spend a couple of hours at Laxe Beach. It's one of the most stunning destinations in the surrounding region for a leisurely picnic. Travelers have a great range of options in and around this destination. It's hard to picture how generations past managed at home without all the mod cons we rely on today. Peer behind the doors of Refugio de Verdes and discover how they did. Still got some time to spare? Love all things art? Treat your eyes to inspiring works and discover the story behind them at Costa da Morte Museum of Contemporary Art. Seeking luxury getaways or cheap vacations in Cabana de Bergantinos? Expedia has just 3 options, so right now's the time to book your room. If you want to make life simpler, why not go with one of our top recommendations, such as the Apartamentos Turísticos Playa de Osmo (A Serra, S/n) or the Turismo Rural - O Xastre de Anos (O Cruceiro, nº4 Lg. Anós)? If you plan to fly in, it's most likely that you'll be touching down at Lavacolla Airport (SCQ). After you've retrieved your baggage and exited the terminal, the heart of Cabana de Bergantinos will be waiting 30 miles (48 km) away. Situated by the ocean, this vacation home is within 3 mi (5 km) of Dolmen de Donbate, Laxe Beach, and Birthplace of Eduardo Pondal. Torres do Allo and Soesto Beach are also within 9 mi (15 km). 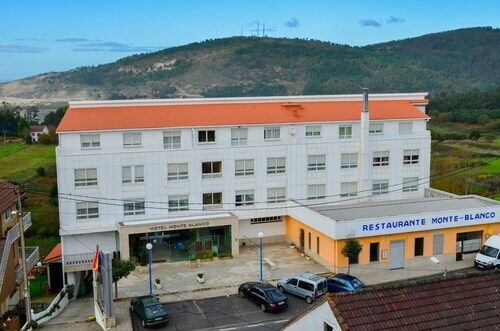 Situated by the sea, this aparthotel is 1.4 mi (2.2 km) from Birthplace of Eduardo Pondal and within 6 mi (10 km) of Dolmen de Donbate and Laxe Beach. Torres do Allo and Osmo Beach are also within 9 mi (15 km). 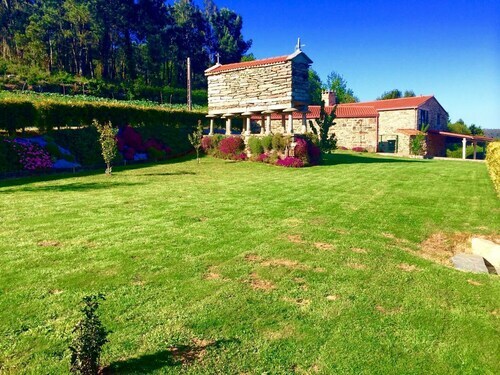 Situated in Cabana de Bergantinos, this country house is 3 mi (4.9 km) from Birthplace of Eduardo Pondal and within 9 mi (15 km) of Torres do Allo and Dolmen de Donbate. Laxe Beach and Osmo Beach are also within 9 mi (15 km). 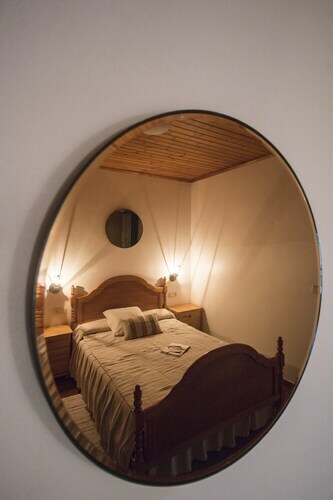 Situated near the beach, this guesthouse is 2.5 mi (4 km) from Torres do Allo and within 9 mi (15 km) of Birthplace of Eduardo Pondal and Dolmen de Donbate. 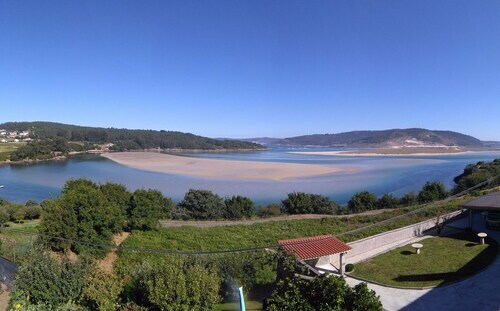 Laxe Beach and Castelo de Vimianzo are also within 12 mi (20 km). 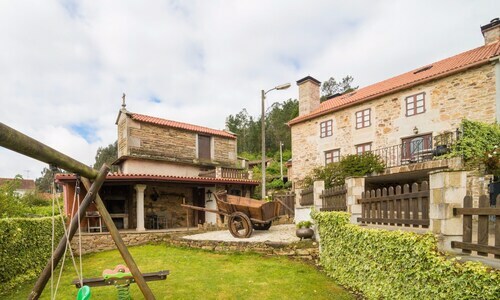 Situated in Cabana de Bergantinos, this vacation home is within 9 mi (15 km) of Birthplace of Eduardo Pondal, Torres do Allo, and Dolmen de Donbate. Laxe Beach and Osmo Beach are also within 9 mi (15 km). 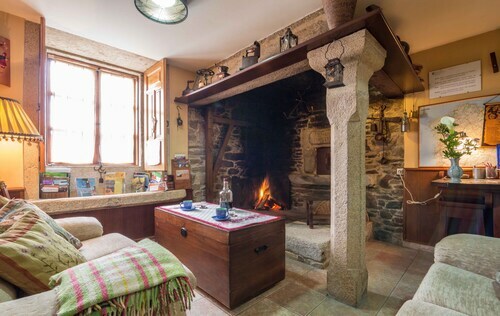 Situated in Cabana de Bergantinos, this cottage is close to Birthplace of Eduardo Pondal and Dolmen de Donbate. Area attractions also include Torres do Allo and Laxe Beach. Situated by the ocean, this romantic vacation home is 2.5 mi (4 km) from Birthplace of Eduardo Pondal and within 6 mi (10 km) of Dolmen de Donbate and Laxe Beach. Torres do Allo and Osmo Beach are also within 9 mi (15 km).